So… I’ve been thinking about how to celebrate my latest accomplishment and while I was doing the dishes one day, an idea struck me. Well, it actually looked up at me with big, soapy eyes. Another dishcloth! I love my crocheted ones a lot more than my knitted cotton ones. They scrub so much better and dry so quick. 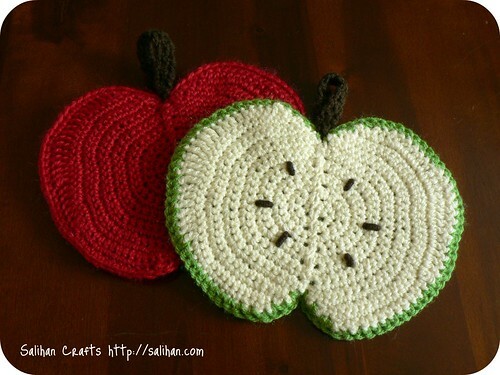 Since I’ve had apples on my brain recently, an apple dishcloth was just what the doctor ordered! You can also find it as a link on my left sidebar, under Free Patterns. P.S. I’ve also added a new feature at the end of all my blog posts. Notice the little Stumble It! link below? If you like what you read here, I hope you will give me a Thumbs Up on StumbleUpon so that other crafters can find my patterns and tutorials. Thankyouverymuchly! I think they make lovely coasters as well. They are a little big to be coasters. 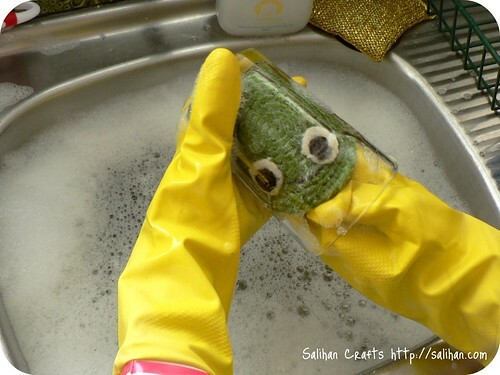 Love the pear dishcloth, those eyes look so cute peeping at you from inside the glass! I think those fruit ones would make good coasters if they were a bit smaller too, or even mats for hot food! Thanks for sharing too. .-= sue´s last blog ..Fa Fa Fa…… =-. Congrats!Very nice!Ilook forward to you blog all week. .-= Julie´s last blog ..Modification Monday: Knitter’s Bella =-. congratulations! 400 posts is impressive – that’s true commitment to blogging. .-= Rowan´s last blog ..Amigurumi in Bosnia and Herzegovina =-. 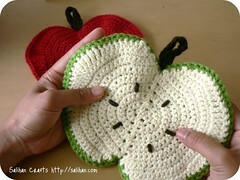 Thanks for posting the Apple dishcloth pattern. It was just in time! I’m currently knitting some for my sister and was looking for something unique to go with the other three and this will be perfect. You rock! 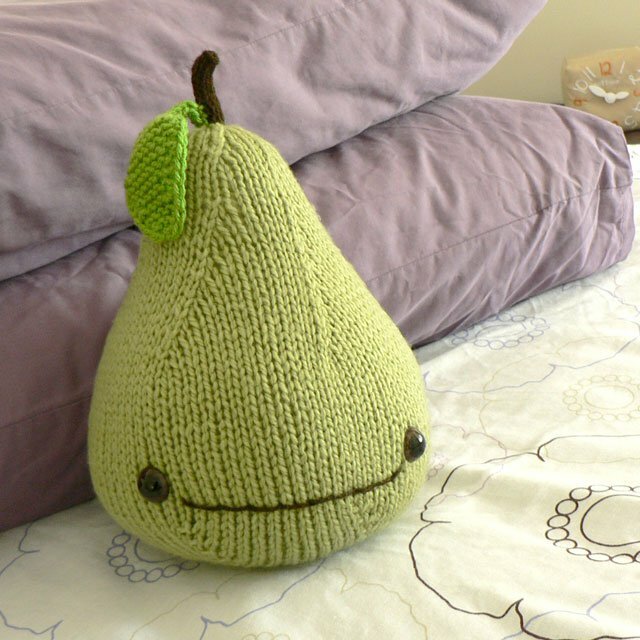 I love the apple, but I think I’m going to have to make the pear first, the eyes are fabulous!! Thanks for sharing and congratulations on your 400th post! .-= Amy´s last blog ..Cultural Slowdown? =-. 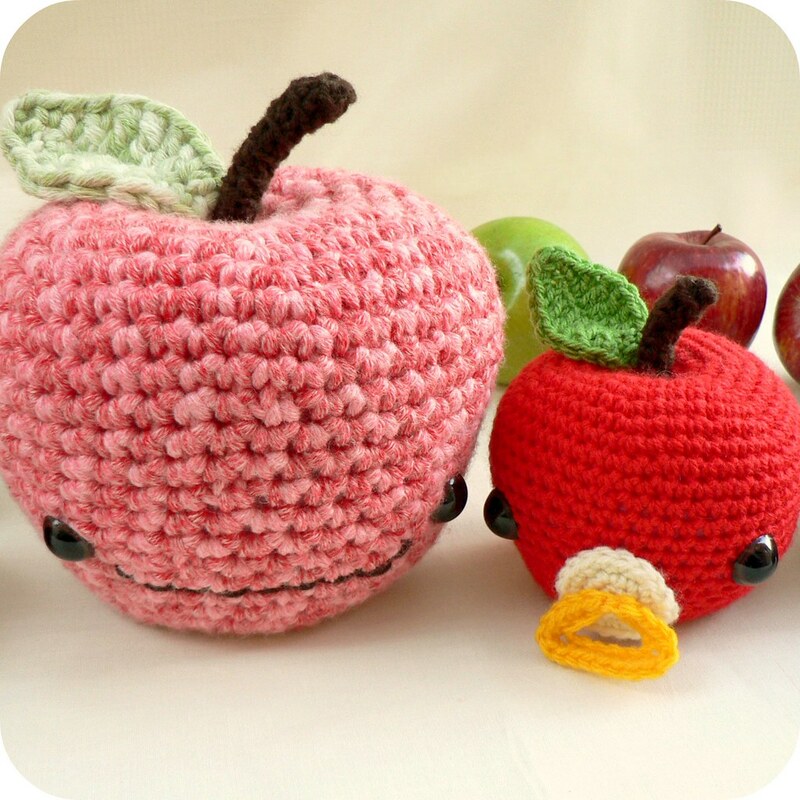 congratulations, and what cute apples! .-= francesca´s last blog ..fleeting =-. .-= Linda´s last blog ..3 More Reasons Why I Love My Cricut/Gypsy =-. I love that apple design. Awesome dishcloth – thanks for sharing!